From leatherwork to palm weaves, the Mexican crafts are uniquely distinct to their artisan origins. The materials used in the each craftsmanship is sourced locally, and the pieces designed and specifications customised in collaboration with our Mexican artisan partners. Antonio learnt his craft from his parents at the age of 7. He now honours his late parents by weaving palm, feeling closer to them in the process. His dream is to keep this tradition alive, and offer a good life to his wife and children. 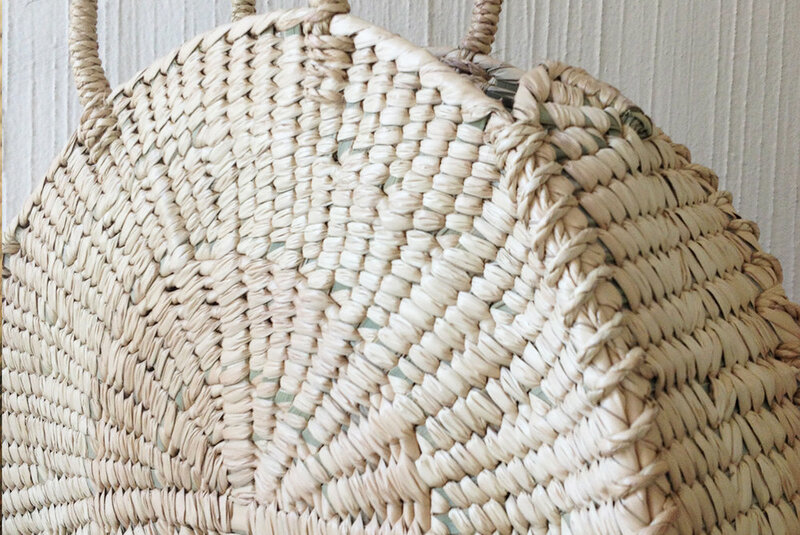 Antonio harvests the palm needed for each bag together with his family, and then weaves on his own for 3 to 4 days to create each exquisitely fine-crafted palm bag. Native from the Mexican state of Chiapas, the trio of artisans Isidro, Juan and Enrique learnt the art of leather making from their families, and are proud to continue this tradition. The trio collaborates and creates their masterpieces by using discarded cow and goat leather. This is a relatively sustainable and eco-friendly way to produce these rustic leatherworks. This incredible group of women ranges from ages 28 to 94! Most have learnt their craft from the other women in their families, purchasing the cotton from the nearby Puebla and dying it themselves before starting the weaving process together. Each cotton clutch piece takes approximately 4 hours to weave, with each artisan sharing a bit of their legacy in every bag. Discover a finely-crafted range of products made from rustic leather or fully natural fibers.